This woodpecker’s name may suggest that its main feature is red feathers on its head, but don’t count on seeing it. The red “cockade” on the side of the head is found only on males of this federally listed endangered species, and is usually only visible during breeding season. The species is a non-migratory, year-round resident of mature pine forests. This need for old-growth, living pines for nesting and roosting means that, as pine forests are cleared, the RCW’s primary habitat dwindles. 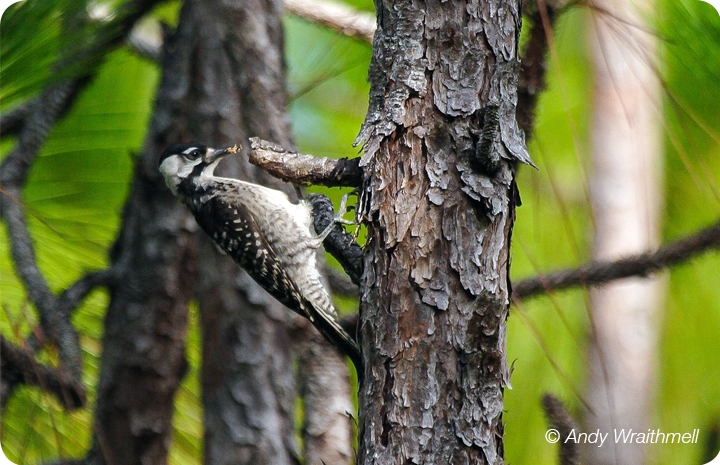 These birds have a knack for locating trees that are infected with a particular fungus that decays the heartwood of the pine and makes carving out a nest hole easier. The world’s largest population is found in the Apalachicola National Forest in the Panhandle of Florida.